The 115th annual North American International Toy Fair at the Javits Center offered something for every kind of kid. The four-day event, where more than 1,000 companies debuted toys for 2018 included augmented-reality robots and coding toys, new kinds of slime and other squishy items, collectibles (L.O.L. Surprise, Shopkins), unique family games, playsets from TV and movies, such as “Incredibles 2” and a fresh take on Fingerlings, classic plush toys and more. While it’s hard to say what the best new toys of 2018 will be, here are some your kids may be clamoring for this year. Woobo is an interactive robot that uses artificial intelligence (AI) to introduce kids to new concepts and learning experiences. He can talk, express feelings, tell stories, sing songs and play games. It includes a parenting app for iOS and Android setup and control capabilities. For ages 4 and older. Price: $199.99; available Summer 2018. 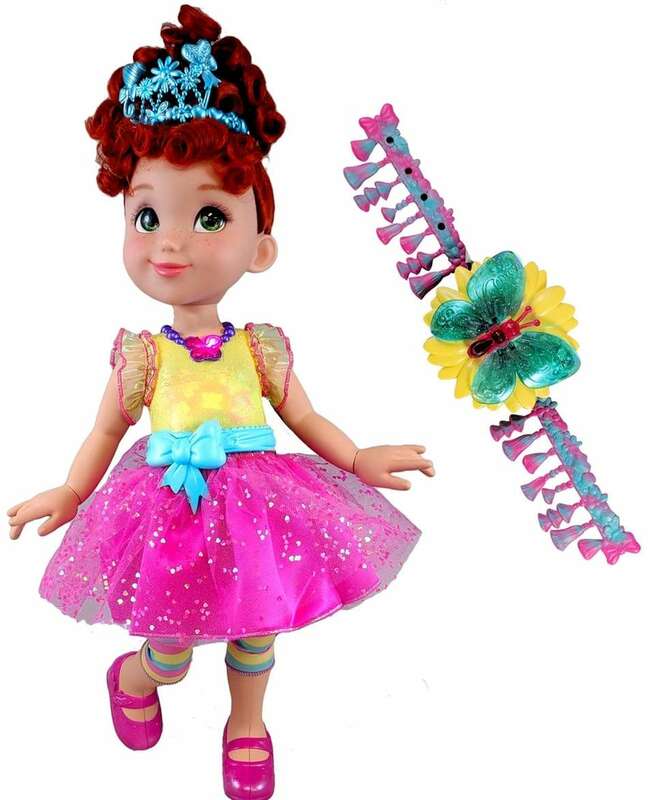 This interactive doll from Jakks Pacific, based on the popular children’s book “Fancy Nancy,” comes with a light-up butterfly bracelet for kids to wear to hear Nancy say 38 phrases or sing songs. Her bodice lights up in six different colors: Blue, yellow, orange, green, pink and purple. For ages 3 and older. Price: $49.99; available fall 2018. There are more than 100 wacky Smasher characters to collect, which are packaged in a Smashball. Kids throw or smash open the packaging to find the character. Season 1 features sports characters, with limited edition and very rare figures to collect. For ages 4 and older. Price: $2.99 for a one-pack; available in spring 2018. The Super Spinner from Play Monster has a round curved seat, adjustable double-braided ropes and weather-resistant clips. 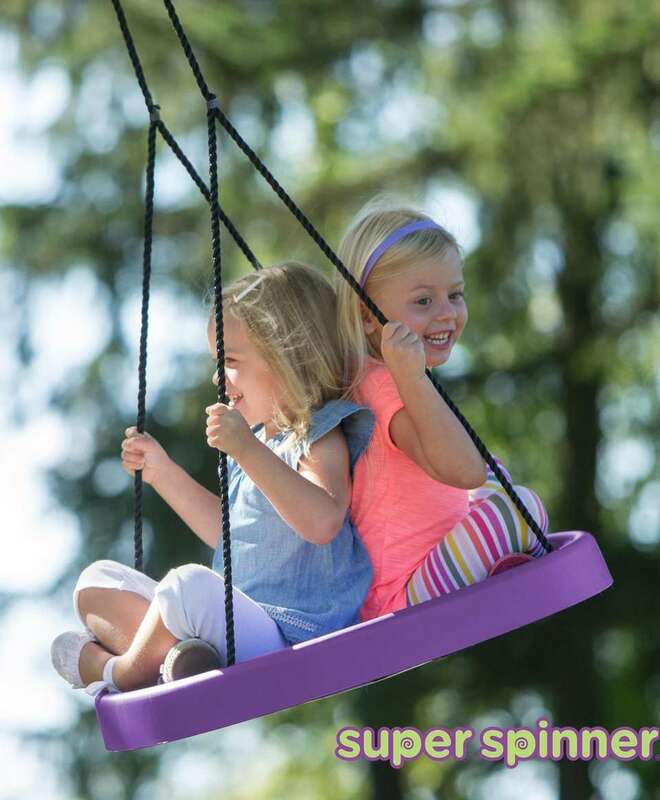 The innovative design lets riders swing from a tree, a play set or a secure beam. There are two Super Spinners available: The original fits one to two kids, holds up to 200 pounds and is available in green, blue, red, purple, pink and yellow. The Super Duper Spinner allows for multiple riders including adults, holds up to 650 pounds and is available in hunter green. For ages 3 and older. Price: $49.99-$89.99; available spring 2018. Polly Pockets from Mattel features micro dolls and accessories in a compact Pocket World. Choose from either this Snowmazing Surprise with Polly and Shani dolls plus a snowboard and sled, Cake-tastrophe with Polly and Shani dolls, as well as a scooter and microphone, or Flamingo Floatie, which comes with Polly and Lila dolls plus a flamingo and swan floaties. For ages 4 and older. Price: $14.99; available fall 2018. In the Pop-a-Zit game, players roll the dice and squeeze the zit, filled with Silly String or water, depending on the number rolled. Each player never knows when it will pop. The game comes with dice, a can of Silly String and one water bottle. For ages 4 and older. Price: $19.99; available fall 2018. 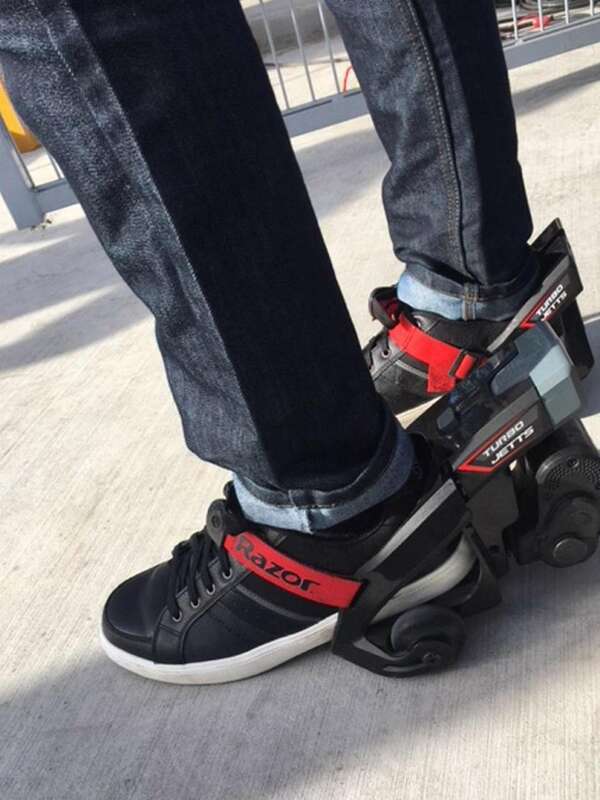 The Razor Turbo Jetts are electric motorized heel wheels that give a boost to any pair of sneakers. The wheels use a power control system that lets users ride at speeds up to 10 mph. It also comes with a hook-and-loop strap for a secure fit. For ages 12 and older. Price: $129.99; available spring 2018. Beaker Creatures are a new line of science-themed collectibles from Learning Resources. With 35 characters to collect, kids can also learn science experiments from the fizzing Reactor Pods on the working lab sets and classification cards. The Science Lab comes with two dissolvable collectible eggs with figures. For ages 5 and older. Price: $24.99; available fall 2018. Race the Air Hogs Drone Power Racers from Spin Master at high speeds and before it crashes, the detachable stunt drone will pop out so it continues to race in the air. It features a gyro-switch to drive or fly in multiple directions and a stunt button. For ages 8 and older. Price: $34.99; available spring 2018. Kids can create scented bath bombs and soaps with the Cool Maker JoJo Siwa DIY Spa set from Spin Master. Mix together four bath bombs and six soaps. The set includes a bomb press, soap tray and a JoJo Bow sleep mask. For ages 8 and older. Price: $19.99; available fall 2018. Kids can create more than 10 different slime experiments with the Star Wars Science Jabba Slime Labe from Basic Fun. The set includes five safe ingredients and a science learning poster. For ages 8 and older. Price: $19.99; available spring 2018. The Croc n’ Roll game from Spin Master challenges kids to jump from one lily pad to another, trying to avoid the unpredictable croc ball. The player with the most lily pads wins. For ages 3 and older. Price: $19.99; available fall 2018. The next wave of Little Pet Shop collectibles from Hasbro feature Hungry Pets, an assortment of bobblehead pets wearing a food-themed costume. They come packaged in a pet food can with an accessory. There are 10 characters to collect. For ages 4 and older. Price: $4.99; available fall 2018. Budding chemists can explore color and create science experiments with the Crayola Color Chemistry Lab Set. The set includes 50 science activities, materials and supplies for 15 experiments and more. For ages 7 and older. Price: $24.99; available August 2018. Turn snacking into a game with Hasbro’s Chow Crown. Choose different foods and add them to the six hanging forks around the crown. Once the spinning crown is on the players head, he or she has to eat as many snacks as possible before the music stops. For ages 8 and older. Price: $24.99; available fall 2018. With Singing Machine’s Kids Karaoke Pedestal, kids can record and playback their songs. It features Bluetooth audio streaming, six voice-changing effects and two microphones. For ages 6 and older. Price: $79.99; available spring 2018. Kids can construct this iconic sports car from Spin Master. The set includes metal nuts and bolts to piece the car together, stick-on decals, working wheels and poseable steering. For ages 10 and older. Price: $39.99; available fall 2018. Mattel’s Hot Wheels Augmoto brings video game play and augmented reality to a physical racetrack. Use the AR technology as you complete laps and bring the cars to life with a loop of fire, oil spills, fireworks and special stops to recharge. It’s also smart device controlled, which is not included. Ages 8 and older. Price: $119.99; available fall 2018. Created by comedian Jeff Foxworthy, Relative Insanity from Play Monster is a game featuring bits of Foxworthy’s material that players can mix and match to create wacky situations. One player reads the setup card, and the other players will decide which of their punchline cards they want to play. The game comes with 100 setup situation cards and 400 punchline response cards. For ages 14 and older. Price: $19.99; available spring 2018. The new L.O.L. Surprise from MGA Entertainment features color-changing fizz. It comes in a glitter purse carrying case with six accessories and a large fizz shell. Drop the fizz shell into water to reveal a special edition doll and little sister (fizz is not for bathtub use). For ages 3 and older. Price: $24.99; available spring 2018. In Yulu’s Tic Tac Tongue game, one player flips over an insect number card. The other two players wear lizard masks and compete to knock down the correct insect card in the shortest amount of time. Be sure to clean the washable tongues and mouthpieces. For ages 4 and older. Price: $14.99; available fall 2018. In this year’s Hatchimals Mystery from Spin Master, there are four unique Hatchimals that can hatch from one egg. Each character has super-soft fur. For ages 5 and older. Price: $59.99; available fall 2018. To play, load up the Slime Burst Hat from Jakks Pacific with the included slime packet. Spin the dial to find out how many times to squeeze the bulb, which pumps up the balloon filled with slime. Players pass the hat and repeat; the first one to get slimed wins. The game includes one hat, four slime packets, a spinner, 48 balloons and more. For ages 6 and older. Price: $19.99; available spring 2018. Create theme park action at home by loading up the conveyor belt with balls to fill the overhead bucket. Pull the bucket cord and watch out as the balls fall below. Attach a water hose for a double waterfall that lands in the inflatable pool. Some assembly required. For ages 3 and older. Price: $109.99; spring 2018. This three-in-one workspace, storage and carrying case keeps the Dohvinci tools and drawing compound organized. The included stencils featuring more than 10 patterns, plus three art boards, a four-sided scraping tool and various drawing tips can encourage unique art pieces. When finished, store everything inside the convenient carrying case. For ages 6 and older. Price: $19.99; available spring 2018. The Herodrive Batman Racer from Funrise features lights, engine sounds and music. Kids can push the windshield to make the wings pop out and propel the car into race mode or press the hood to hear Batman sounds. For ages 3 and older. Price: $24.99; available fall 2018. Flush Force from Spin Master is a new toy line with more than 150 characters to collect. The Flush Force Potty Wagon features stackable mini portable toilets, a plunger catapult and two exclusive Flushie characters that are hidden in water-reveal portable toilet. For ages 4 and older. Price: $24.99; available fall 2018. The new plush line from Spin Master features a distinctive look with a toothy smile or grimace. There are more than 50 characters to collect and each box includes an adoption certificate. For ages 4 and older. Price: $14.99; available fall 2018. The Grand Department Store is the focal point of the Calico Critters’ new series. The design allows kids to alter the layout by repositioning various features such as the terrace, balconies, windows and awnings. Kids can let their critters into the store through the revolving tower doors, then explore different levels using the elevator. The set also comes with a Stella Hopscotch Rabbit figure. For ages 6 and older. Price: $129.95; available fall 2018. Little Tikes’ Splash Face is an outdoor tug-of-war game, in which players try not to get soaked with water. For added safety, four stakes attach the toy to the ground. For ages 4 and older. Price: $39.99; available spring 2018. Hidden in each blind bag is one of eight new surprise Baby Band Calico Critters that kids can add to their nursery collection. Each bag includes a baby critter and a musical instrument. For ages 3 and older. Price: $4.99 each; available spring 2018. Players take turns setting pirate pieces on the teetering pirate ship. The goal is to try and keep the characters steady and the boat from tipping over. For ages 5 and older. Price: $24.99; available spring 2018. With eight modules to solve, the Spy Code Hackathon from Yulu encourages players to work together to hack. One player keeps an eye out while the other player works as the hands of the mission. For ages 6 and older. Price: 29.99; available fall 2018. If you roll, shake or flip the Grumblies from Skyrocket, they’ll rumble into a meltdown and only you can calm them down. Each character features more than 40 sounds and reactions. Choose from four different designs. For ages 4 and older. Price: $19.99; available fall 2018. With a light and sound panel, working crane, laser launcher and rolling lab charger, Romeo’s Lab Playset from Just Play offers kids dual-level play. The set includes a Romeo figure, Romeo’s robot figure, lab charger and three tools. It can also be transformed into a mobile lab by using the attached wheels for transport. For ages 3 and older. Price: $39.99; available fall 2018. The Groove Mini from Singing Machine features six voice changer effects, MP3 and MP3+G compatibility to share the lyrics on the big screen and a disco light show. It also includes a Bluetooth connection for wireless audio streaming, two microphone jacks and one wired microphone for karaoke. For ages 6 and older. Price: $49.99; available fall 2018. This 400-piece Inventions Wheels Pack from Mattel includes six Beyonder pieces, specialty parts, six colors and many wheels to create cars and other vehicles. For ages 5 and older. Price: $19.99; available fall 2018. The Morfboard Scoot and Skate combination from Jakks Pacific uses special technology to transform kids’ play experience from skate to ride in seconds. Just drop the included Xtensions into the board, turn them 90 degrees and the flex trigger locks in place. Available in a variety of colors, it also includes front and rear skates, scoot Xtensions and a scoot T-bar with adjustable height and antislip grips. For ages 8 and older. Price: $99.99; available spring 2018. Marshall’s Rescue Fire Truck set from Spin Master comes equipped with flashing lights and sounds, extendible ladder and a cart that’s stored inside. For ages 3 and older. Price: $59.99; available fall 2018. The Crayola Scribble Scrubbie Pets are figures that can be colored and washed over again. The playset includes four pets, six washable markers and a tub. There are expansion packs (sold separately) with up to 12 pets to collect. For ages 3 and older. Price: $19.99; available summer 2018. The NightBat from Tangle Creations features motion-activated LED lights along the sleeve, which glows with every swing and hit. It also comes with a NightBall that also features LEDs. For ages 6 and older. Price: $24.99; available now. The Sky Viper Scout Video Drone from Skyrocket features surface scan technology that increases stability, allowing the drone to stay in one spot. It works up to 100 feet, and includes an auto launch and land, one-touch stunts, extended flight time and the ability to stream and record HD video. For ages 12 and older. Price: $89.99; available fall 2018. Kids can customize their own bot from Basic Play while learning about robotics. The unicorn, puppy or bunny set comes with more than 20 decorative pieces. Kids can also train their bot to walk, jump and play using the included magnetic accessory or by simply clapping their hands. For ages 5 and older. Price: $19.99; available fall 2018. Zoomer the Playful Pup from Spin Master walks, scampers, shakes, pounces and plays. He recognizes your voice so you can give him a name, performs tricks, rolls over and more. For ages 5 and older. Price: $99.99; available fall 2018. The new Twinkle Clay line from Spin Master features clay with a quick, air-dry oven that dries creations in less than 30 minutes. The Princess Studio comes with sparkling clay to make princess crowns, wands, jewelry and more. For ages 4 and older. Price: $24.99; available fall 2018. Scout, from Elemental Paths, is visiting Earth for the first time and although he has a lot of knowledge, he still needs to learn about humans. The artificial-intelligence-controlled character responds to educational interactions and emotional responses. For example, if the user expressess sadness, Scout may tell a joke. Through LED screens and sensors, he can recognize when he is being picked up or when the lights are off, and react accordingly. Connect using Wi-Fi and Bluetooth. For ages 8 and older. Price: $150; available fall 2018. Sculptapalooza from Educational Insights is a party game in which two teams draw cards and use the squishy Playfoam to sculpt what they see. You may have to sculpt with your eyes closed, tag team another player and more. Players must guess what their team sculpted before time runs out to score a point; the team to earn 20 points wins. For ages 10 and older. Price: $19.99; available spring 2018. Simply push up the Pikmi Pops Pushmi Ups from Moose Toys to reveal one of 12 new scented plush characters, a sweet message, dangler string and a collector’s guide. For ages 5 and older. Price: $19.99; available spring 2018. To play the Hot Tub High Dive game from Hasbro, players press the button to move the diver up or down the ladder. Each time the button is pressed it increases the amount of foam in the tub. Once the diver reaches the top, he’ll “dive” into the tub with foam flying into one player’s face. The game includes a tub with removable fabric screen, diver figure, ladder, spinner and bubble solution. For ages 4 and older. Price: $19.99; available fall 2018. This kit from Thames & Cosmos features Pepper Mint and her scientist aunt who lives in a treehouse. The treehouse does not have electricity, so they come up with mechanical inventions to handle day-to-day tasks, using skills of science, technology, engineering and math. Some projects include a rope ladder, a pulley to lift heavy objects into the treehouse, a rubber band-powered lift, a rotating palm leaf umbrella, a zip line, a catapult and a trap door. The kit features materials to build the treehouse and to do the projects, a storybook as well as a Pepper Mint figure. For ages 8 and older. Price: $39.95; available summer 2018. This playset from Playmobil includes a functioning laser gun, a working temple gate, a pulley to bring equipment to the top floor, a flashlight to reveal glow-in-the-dark features, such as the ruin’s crystal eyes, jungle plant and more. The T-Rex has movable arms, legs and jaw. It also comes with the Explorers team (Nick, Emma, Will and their dog Sammy), a laptop, camera, gold statue, microscope, hiking equipment and more. For ages 4 and older. Price: $59.99; available spring 2018. Create mini-tart pastries with the Real Cooking Mini Tarts set from Skyrocket. It includes a pastry maker and food ingredients — just supply the milk and eggs. Mix it up with jam, chocolate marshmallows and more. For ages 6 and older. Price: $19.99; available fall 2018. This interactive Leapfrog toy is a backpack, puzzle, and writing and drawing board in one. Kids can place the 26 letter pieces into puzzle spots to see the letters on the LCD screen, hear the letter name and an animal that begins with that letter. It also introduces step-by-step writing with Mr. Pencil and features seven different activities. For ages 3 and older. Price: $29.99; available in fall 2018. Design Juicy Couture bracelets with this kit from Make It Real. The set includes materials to make five different bracelets including chains, Juicy charms and more. For ages 8 and older. Price: $19.99; available in fall 2018. The Toilet Paper Blaster from Jakks Pacific uses real toilet paper and can blast up to 30 feet.Simply load the toilet paper and add water. For ages 8 and older. Price: $19.99; available in fall 2018. The LeapStart 3D from LeapFrog features touch-and-talk counting, reading and more than 30 activities with 3D-like animations. Use the stylus to trigger questions, challenges, songs, jokes and more on every page. There are more than 25 books that can be purchased separately. For ages 2 and older. Price: $49.99; available in fall 2018. With a “Deadpool” sequel set for a 2018 release, kids can join in on the action with dual katana swords, designed to look like the ones seen in the comics. For ages 14 and older. Price: $19.99; available in fall 2018. Wicked Cool Toys partnered with the TV series “The Loud House” to launch a line of collectible figures and plush toys. The eight-inch characters are expressive, colorful and feature Lincoln, Clyde, Luna, Lucy, Lana, Lola and Lori. For ages 4 and older. Price: $9.99 each; available in fall 2018. CozyPhones from Wicked Cool Toys are lightweight, comfortable and washable headphones. They feature thin speakers in the fleece headband for a comfortable fit for most head sizes. Built-in volume control and a cable are included. Styles include Paw Patrol (Chase, Marshall and Skye), Teenage Mutant Ninja Turtles, JoJo Siwa, unicorn, fox, frog and panda. For ages 4 and older. Price: $19.99; available in fall 2018. The littleBits Hall of Fame kits allow kids to invent. With the Crawly Creature kit, kids can build an electronic pet. The Bubble Bot set teaches kids to build a bubble-blowing robot. The Night Light kit has LED lights and is sound-activated to work whenever kids are awake before bed. The Arcade Game puts a spin on a classic pinball machine. Each set comes with bits, accessories and instructions. For ages 8 and older. Price: $39.99; available in summer 2018. Young singers can step into the spotlight with the Kidi Star Karaoke Machine from VTech. It has multiple features including a music magic mode to reduce or remove the main vocal track and a voice recording option to play back musical creations. Choose from eight original songs or use the included audio cable to connect personal devices for more song options. A disco light with 180-degree color effects and audience sound effects, like applause and cheering, are incuded for even more fun. For ages 5 and older. Price: $49.99; available Fall 2018. Designed to grow with a child, the Safari Learning Station from LeapFrog allows little ones to sit and play, learn first words, numbers, shapes, colors, animals, Spanish, music and more. As the child grows, raise the arch up so kids can crawl under it and pull the hanging leaves or stand and play with the animals. Kids can also drop the balls through the monkey’s tail, play the light-up piano and more. For ages 6 months and older. Price: $49.99; available Fall 2018. Little athletes can learn to play basketball, soccer, football and baseball with ESPN Future Pro balls from Hunter Products. Each ball was designed by athletes. For ages 5 and older. Price: $4.99-$14.99; available spring 2018. To play LeapFrog’s Pop & Soccer game, press the chunky buttons to move the animals or to block goals. The sensor in the net will respond with cheers and applause when the ball passes by one of the goalies. The set features phrases, songs and sound effects. For ages 1 and older. Price: $24.99; available Fall 2018. Just like in the show, kids can go on tour with Vampirina and The Ghoul Girls band with the Rock N’ Jam Touring Van from Just Play. The van transforms into a stage with music, rock and roll sounds, lights, signature phrases and more. The driver’s seat becomes a couch, the bunk beds flip up to reveal speakers and the spiral stairs are piano keys. The set comes with Vampirina, Poppy and many accessories. For ages 3 and older. Price: $39.99; available Fall 2018. These musical friends from Wicked Cool Toys sing a song when hugged. Songs can be played in three 30-second clips. There are four styles to choose from: Adventure Teddy Ruxpin, Friendship Teddy Ruxpin, Lullaby Teddy Ruxpin or Grubby. For ages 2 and older. Price: $19.99; available in fall 2018. Elmo encourages kids to dance and sing along to three musical modes (colors, animals and music remix) that are activated by Elmo’s headphones. Elmo’s heart lights up to the beat and he swings his arms, tilts his head and shakes his hips. His headphones double as a handle. For ages 18 months and older. Price: $ 39.99; available spring 2018. Based on the classic children’s book and new Netflix series, this interactive Mama Llama from Cuddle Barn recites the entire “Llama Llama Red Pajama” book. The plush also comes with Llama Llama. For ages 2 and older. Price: $39.99; available spring 2018. 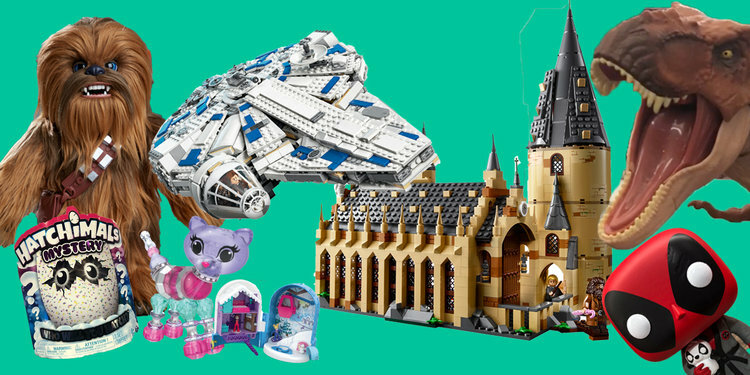 The best-selling toys on Amazon right nowHere are the toys that are the most popular on Amazon this month.Blind packs: This year’s big toy trendBlind packs, a subset of collectibles, grew 60 percent since January 2017.42 toy trends your kids will be asking for this yearThe chosen toys are typically the most in-demand playthings for kids. We’re revamping our Comments section. Learn more and share your input.